In today’s blog, Helen gives a background on aquamarine – March’s birthstone; a beautiful stone that ranges in colour from green to a blue. Aquamarines are highly prized for their colour, the deeper and more intense the better. Pastel aquamarines (the ones we tend to see on the UK high street) are many times less expensive than those stones that are a strong or deep blue and greenish blue. Aquamarines are often heat-treated to remove the greenish tint, and most modern production is routinely treated this way. For me, a sea green aquamarine is the most beautiful colour of them all, but commercially, deep blue (without any green at all), is the most expensive. Most aquamarines are now sourced from Mozambique, Zambia, Pakistan and Nigeria. Historically Brazil was the world’s largest producer of aquamarine, but recent tightening of Brazilian employment and environmental legislation has made it more expensive to mine there and so most gem-quality aquamarines now come from East Africa. Geologically, aquamarines are found in pegmatites, the coarse-textured crystal accumulations found in major igneous intrusive rocks. If ethical sourcing of gems is important to you, then Brazilian aquamarines should be your preference. The miners will have been paid decent wages, their work environment will have been reasonably safe, and government agencies will have ensured that environmental damage from mining activity was minimised. I am certain that the same cannot be said for aquamarines sourced from elsewhere. One of the cleanest gemstones – a gemstone with very few natural blemishes or imperfections - aquamarines can be cut as very large gems. 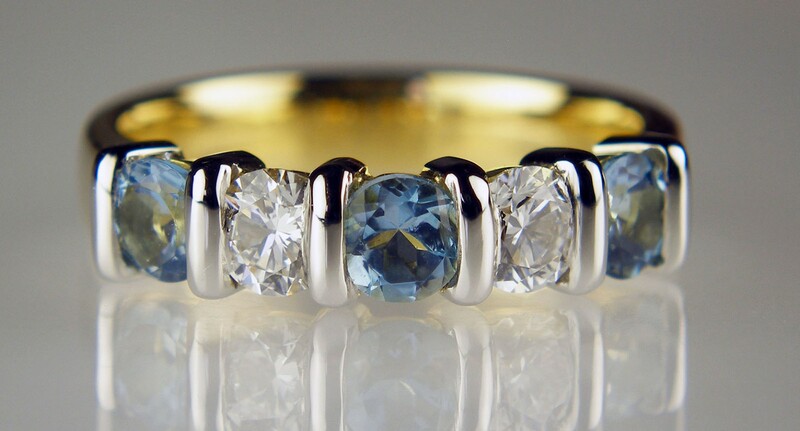 Customers often request large aquamarines to be set in rings, but this can be problematic as to ensure optimum light reflection from the back facets of the cut gem, the gemstone may be very deep and the resulting ring will stick out high above the finger, making it uncomfortable to wear. Aquamarine is a variety of the mineral beryl (beryllium aluminium silicate). The colour ranges from green to bluish green to blue, with the intensity of blue varying from almost colourless to deep intense blue. The colour of beryl is determined by trace impurities of different metal ions being present in the beryl crystal lattice. Ferrous iron (Fe 2+) is the impurity in aquamarine and which causes it to have a blue colour. To see our stunning range of jewellery made using aquamarine, visit our gallery, or if you are interested in commissioning a special piece of jewellery, get in touch with us. 4mm round aquamarines & diamonds set in 18ct yellow gold ring with platinum veneers. Total diamond weight 0.47ct, aquamarine weight 0.67ct. Diamond grade F/VS. 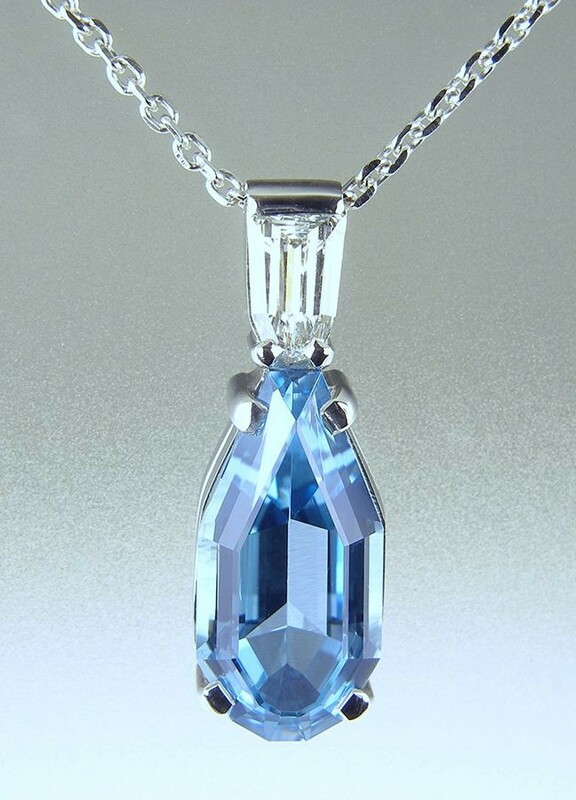 Aquamarine & diamond pendant in platinum set with 2.94ct special cut aquamarine & 0.24ct obelisk cut diamond.